Is Your Cat Happy Sleeping In Your Bed? Ug! Another night of cats sleeping in my bed! 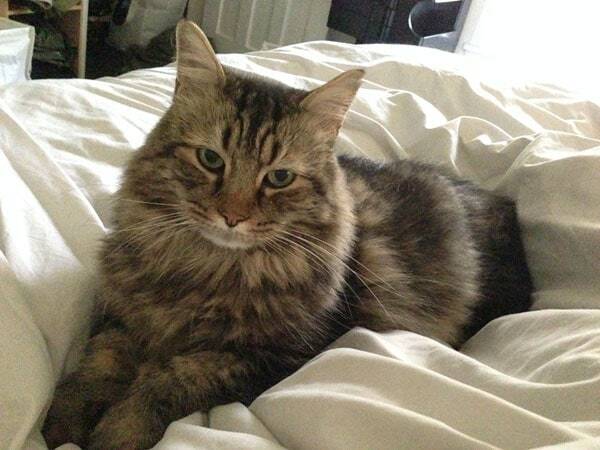 I have some strong instincts about cats’ needs from observing Hepper and Hudson (and my first kitty, Booker), but to learn more I recently reached out to a Cat Behaviorist. I wanted to learn more about the how and why of my cats sleeping behaviors, and do I really need to put up with the cats sleeping in my bed?! Have a read and let me know what you think in the comments! Throughout an entire day, a cat sleeps around 14 – 16 hours on and off, so sleep is a very sacred and important ritual for our feline friends. Although it hasn’t be shown why cats sleep so much, it is likely due to their diet and activity in the wild. As mentioned earlier, cats are (http://en.wikipedia.org/wiki/Crepuscular) crepuscular animals. This means they are most active during dawn and dusk – a time when most of their natural prey (birds) are also most active. You may have also noticed that cats are prone to sleeping whenever they want to during the day, followed by running around the house whenever they want – typically early in the morning when you are trying to sleep! Cats also remain relatively alert as they sleep and you may even see their ears move towards certain sounds as they snooze. This is another reason why cats typically have 14 – 16 hours worth of short periods of sleep, rather than a couple of long sleeps. This is thought to be a natural behaviour to stay alert in order to be aware of any nearby predators. Cats will sleep wherever they can make themselves comfortable, but typically they prefer an area that is warm, comfortable, raised up off the ground, and an enclosed space. It is a good idea to have a number of sleeping areas and cat beds available in a number of different rooms. Each cat in your home needs to have a safe place they can retreat to if they are stressed or nervous. You will quickly be able to identify your cat’s safe place in your home when you think back and consider a time they were stressed or scared. Where did they run to? Did they hide anywhere? Ideally each cat in your home would have a room they can each retreat to, to avoid one another if necessary. Having multiple comfortable and safe sleeping areas and a safe place for each cat in your home, will have an almost immediate effect in reducing stress and increasing your cat’s happiness levels! 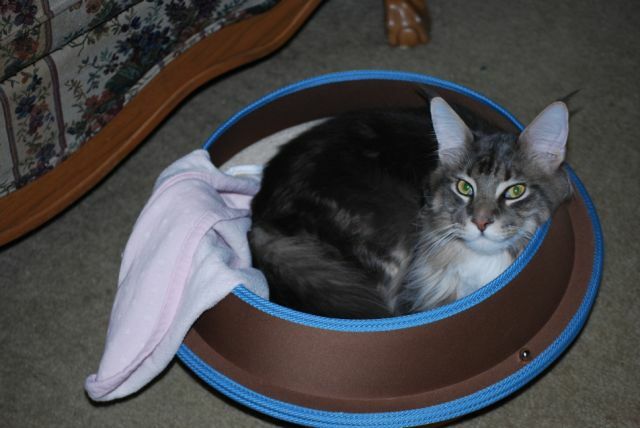 There are many pet beds currently available on the market ranging from soft padded cushions, to hammocks, to paw-print covered cat caves. Fortunately there are some fantastic new designs now on the market such as the Hepper Pod bed which not only perfectly suit the needs of cats, but also do so in style. 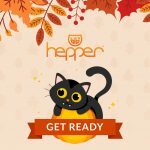 Having a bed that is suited to the exact needs of a cat means that the Hepper Pod bed will be very popular in your home. 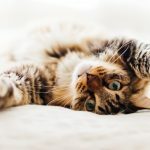 Ideally having a couple of pods per cat in separate areas means that the natural sleep rotation that occurs with cats, can take place in your home. 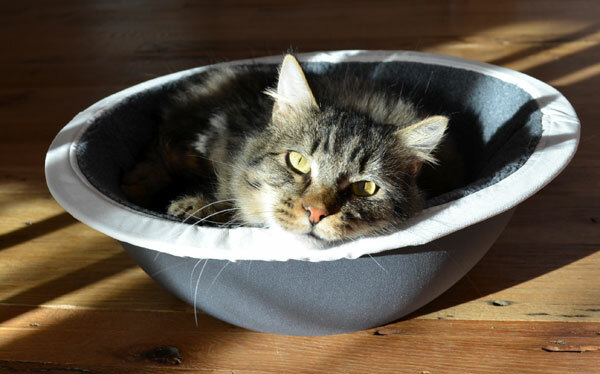 Cats will sleep wherever they like, however they do tend to favour warm, quiet and comfortable places – which is why the Hepper Pod bed is always so popular. Having several spots around your home where your cat can snuggle up and rest peacefully is all part of creating their ideal indoor space. Having a couple of Hepper Pod beds per cat is a great start, and ideally these would be in two very different rooms. ● Any bed in any room! If it is comfortable, warm, quiet, or preferably all of these things, your cat will probably sleep there. Because cats tend to sleep for short periods of the day, broken up by periods of grooming, playing and eating, they also tend to move from bed to bed. This is why having at least a couple of different sleep areas available for each cat in your home is a good idea. Creating a safe spot for each cat in your home will take care of one of these areas for each cat. 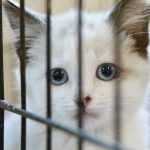 After having observed each of your cats in your home, you probably already have a pretty good idea of where they run to if they are stressed or nervous. This is also possibly the place they spend most of their time sleeping. 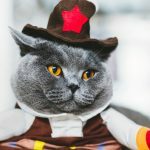 Locating and enhancing your cat’s safe space is one of the most important parts of creating the ideal cat friendly home. If you aren’t sure where your cat’s safe place is, spend a few days observing him or her and make a note of where most of their time is spent. Where do they go when someone comes to the door? Where to they spend most of their time sleeping? With some time and observation, it won’t take long to work this out. If you don’t think your cat has a safe place, then you need to take a careful look at the map of your home you made earlier, and make a decision of where the quietest and warmest spot might be for your cat to head to. If you have more than one cat, then each cat may need their own room with a safe place in it. This might be a warm cat bed on top of a wardrobe for one cat, and a Hepper Pod bed in the study for the other cat. For cats within a household that get along to the point where they will snuggle and groom each other, having their safe places in the same room would be fine – particularly if you are in a small home. Cats are typically either ‘tree dwellers’ or ‘bush dwellers’ – sometimes they are both! A ‘tree dwelling’ cat will prefer to get up high, and will feel safer at a height, whereas ‘bush dwelling cats’ prefer to stay at ground level, but need to have something they can hide and feel safe in. Decide if your cat is one, the other or both, and take this into consideration when choosing and creating their safe place. ● It should be away from litter boxes and food bowls. ● Having a water bowl nearby is a good idea. ● If there are tensions between pets in your home, try to limit access to this space for the cat in question. By giving each cat in your home their own safe space, this will decrease tensions between your cat and any other cat or animal. It will also help them to destress in their own time, and ultimately lead to less behavioural issues – meaning happier cats. Pretty Great, right? That’s just one section of the huge new guide that Dr. Edwards wrote for us. It’s coming out soon! Let me know any thoughts in the comments below! Hello Jed: Good information! I have two Balinese kitties; one is almost 2 and the other almost 1. They are brothers with the same mom and dad but, of course, different litters. When someone knocks on the door, or there is an unfamiliar loud noise, both hurry scurry off to their respective hiding places. The 2 year old loves to get under the bed or under an easy chair that has a “skirt” all around….it’s been his fave since he was a newbie 8 week old kitten. Now he’s 12 lbs and has a long hair…he thinks that he’s still as invisible under that chair as when he was a kitten – but now his bushy tail tells him off…..that fluffy tail just doesn’t fit under the chair and so sticks out a good 4 inches! The 1 year old is still kinda tiny, maybe 7 lbs and he has a short velvety coat. He heads for a cabinet…. (he can open any door)…so to make it safe I have one cabinet under the sink in the master bath that is all set up for him. 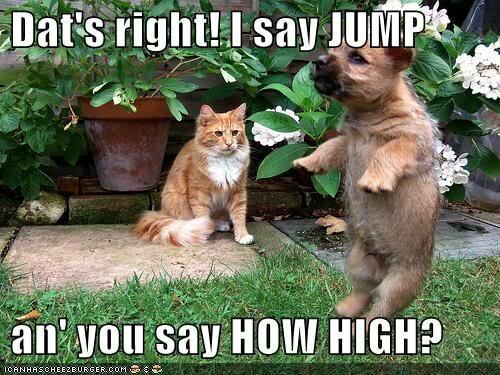 They both do sleep a lot and tend to play in the wee hours of the AM and then again at dusk…one loves to be up high and the other likes his paws on the ground!….so thanks Dr. Edwards for your comments that have helped me to understand my boys a bit better! Looking forward to seeing the new bed! thanks Kim – it’s a draft and we’ll be sure to make that change… I appreciate your eagle eye! I love the look of the hepper bed. 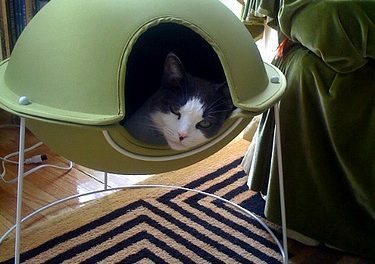 But I’d like it more if it were customizable (pick insert color, pod color, frame color) and if I could stack the pods somehow and easily put in an electric cat warming pad without ruining the look (my tiny 15 year old gets cold easily and does not want to share her bed with her hulking 4 year old boyfriend). This is brilliant! I already learned more about my cats from reading this first entry. Now I understand why they are choosing certain places around the house for their ‘naps.’ I look forward to the full ebook! Thanks Jed and Dr.Edwards. 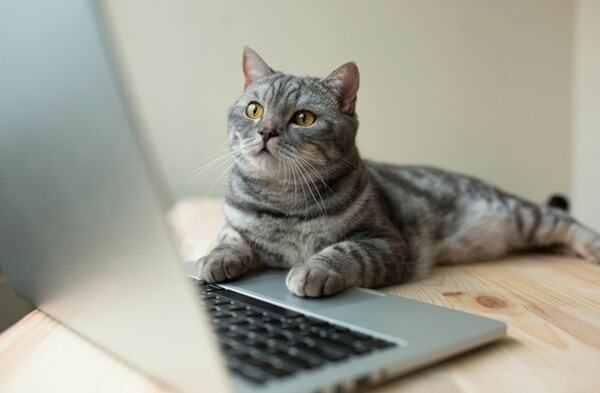 Hey Nancy – yeah, I thought that living with cats for the past 20 years that I would know everything, but Dr. Edwards has been teaching me a ton! I really enjoyed this!! I am def going to be getting the book when it comes out as well. My cats used to scurry far and wide when the buzzer rang but thankfully have gotten used to it. They would hide under the couch since they aren’t allowed in the bedroom. But they prob would have went under the bed or the covers (yes they get under the blanket somehow) like they used to when they could be in that room. We actually bought them each a Hepper since they can’t sleep with us anymore. My bf is highly allergic so no cats in the bed. Honestly I miss it but we have to do it! Looking forward to the new bed as well, we may just have to get a few more for them for the dining room.